The 'Butterflies' series is an early PILGRIM classic. 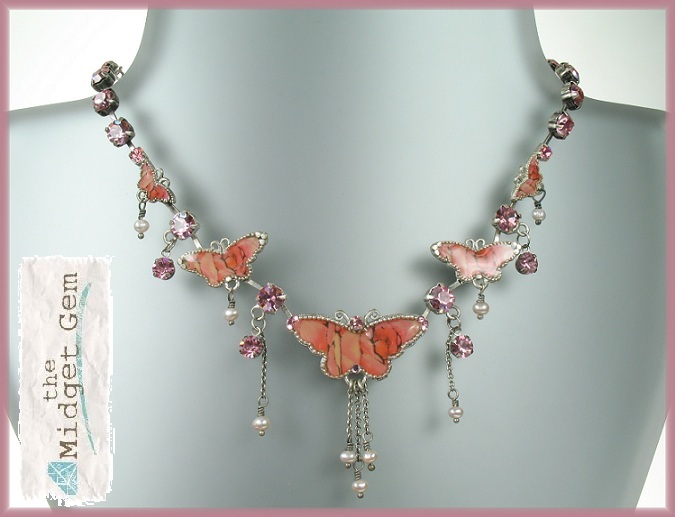 A collection comprising hand-crafted butterfly elements with freshwater pearls and Swarovski crystals. The butterflies are made with colourful paper inlays that are then enamelled with clear covers - giving them an added depth of colour and interest. We have limited stock that has been kept carefully from new. We also have other items that are not yet listed. Pretty butterfly pendant necklace. Dark blue with turquoise flowers, pearls and Swarovski crystals. Pendant measures 6.5 cm/65 mm wingspan, this is hung from a double stranded chain, the length of the necklace is 14 inches /36 cm to an adjustable 17 inches/ 43.5 cm. Burnished silver plate. 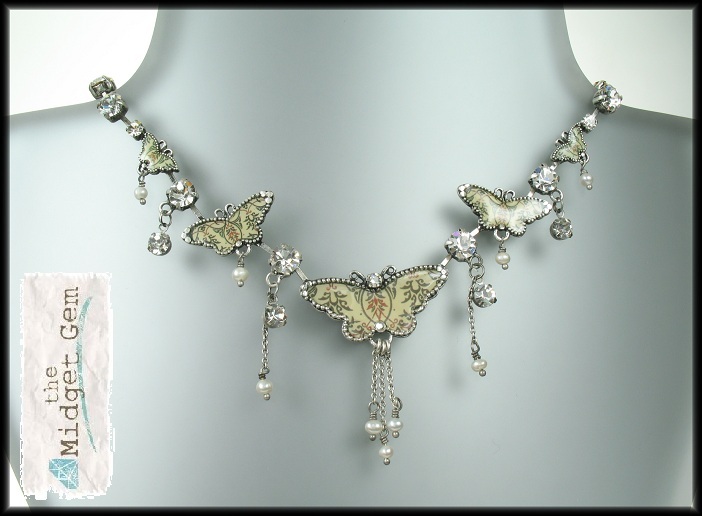 Elaborate butterfly charm necklace. Light blue with Sapphire blue Swarovski crystals and white freshwater pearls. Length 14 inches/36 cm to an adjustable 17 inches/43cm. Burnished silver plate. 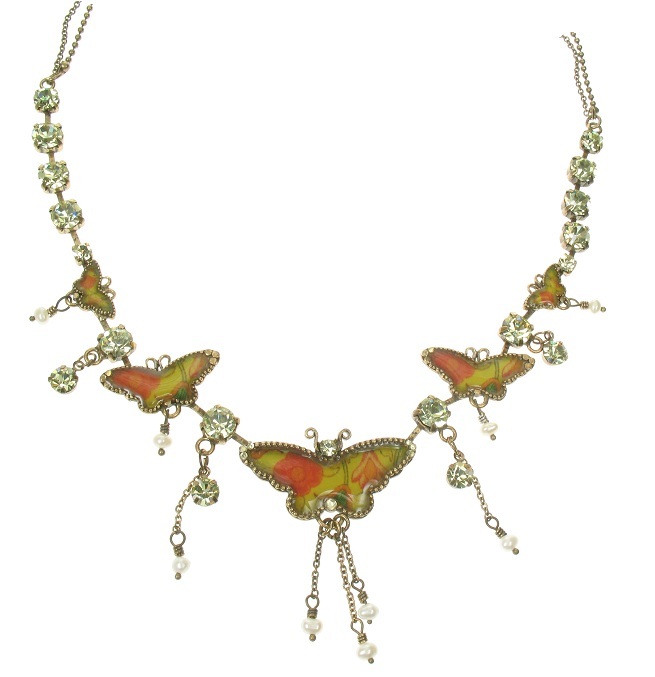 Elaborate butterfly charm necklace. Shades of pink roses, pearls and Swarovski crystals. Length 14 inches/36 cm to an adjustable 17 inches/43cm. Burnished silver plate. 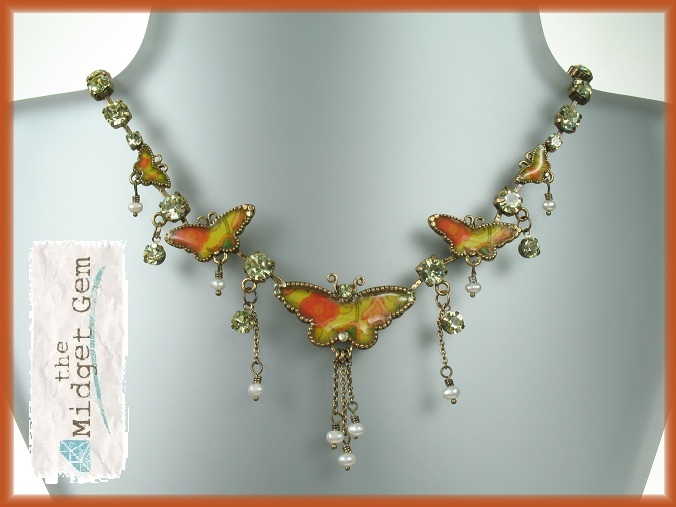 Elaborate butterfly charm necklace. Cream and beige with clear Swarovski crystals and white freshwater pearls. Length 14 inches/36 cm to an adjustable 17 inches/43cm. Burnished silver plate. Elaborate butterfly charm necklace. Yellow with orange/red poppies, yellow Swarovski crystals and white freshwater pearls. Length 14 inches/36 cm to an adjustable 17 inches/43cm. Burnished gold plate. Pretty butterfly pendant necklace. In yellow with orange flowers, pearls and Swarovski crystals. Pendant measures 6.5 cm/65 mm wingspan, this is hung from a double stranded chain, the length of the necklace is 14 inches /36 cm to an adjustable 17 inches/ 43.5 cm. Burnished gold plate. Large pendant necklace. The pendant measures 12 cm/120 mm wingspan, this is hung from a double stranded chain, the length of the necklace is 14 inches /36 cm with a 3 inch extension chain, to an adjustable 17 inches/ 43.5 cm. Oxidised silver plate. 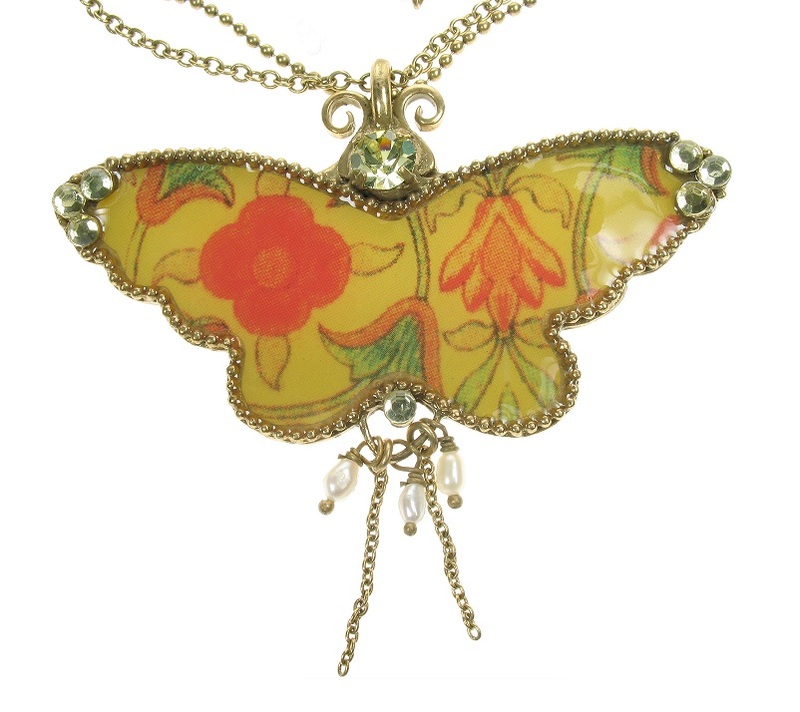 Pretty butterfly pendant necklace. Cream background with subtle blue and red details. Pearls and Swarovski crystals. Pendant measures 6.5 cm/65 mm wingspan, this is hung from a double stranded chain, the length of the necklace is 14 inches /36 cm to an adjustable 17 inches/ 43.5 cm. Burnished silver plate.